The private spaceflight company SpaceX wants to launch missions for the United States military, and soon it will be ready to do so, the firm's billionaire founder Elon Musk told a Senate subcomittee Wednesday (March 5). SpaceX will be ready to compete for Air Force contracts using its new Falcon rocket soon, Elon Musk told a U.S. Senate Appropriations Subcommittee on Defense hearing. SpaceX currently flies missions for NASA and private contractors. SpaceX has now completed part of a major requirement to compete for Air Force Evolved Expendable Launch Vehicle (EELV) contracts with the company's upgraded Falcon 9 v1.1 rocket. In order to be considered for contracts, SpaceX needs to complete three successful launches of the new rocket. The Air Force has already formally certified the upgraded Falcon's maiden launch on Sept. 29, 2013, and since then, SpaceX has completed two more launches with the new Falcon. Though the two successive launches have not been formally certified, officials do not expect any problems, according to a Space News report. Musk is confident that SpaceX will be eligible to compete for 14 EELV launches in fiscal year 2015. "I believe SpaceX can manage all of the Air Force requirements," Musk said. We might argue that maybe some of those requirements shouldn’t be there, but we will meet whatever requirements the Air Force asks of us. We believe that we can manage all of the Air Force's satellites and then some." At the moment, the Air Force use the Atlas 5 and Delta 4 rockets built by United Launch Alliance to launch their payloads into space. The private company is a collaboration of Lockheed Martin and Boeing, two major competitors for Air Force launch contracts before they created the joint venture in 2006. "I think, as a country, we've generally decided that competition in the free market is a good thing, and that monopolies are not good," Musk said. "The reality is, when competition is introduced, reliability is a key factor in competition. That would be a deciding factor in who wins what launches. It doesn't become less important, it becomes more important. The cost to the tax payer will drop substantially." "I think it's fair to say that NASA doesn't have the same policy requirements for assured access to space that DoD [Department of Defense] does," Pace said. "I dealt, when I was at NASA, with a lot of the science mission community, and they were plainly opportunistic. 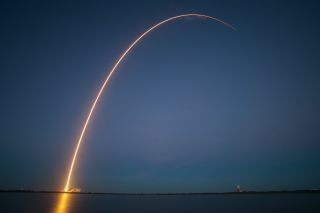 They would buy the most reliable vehicle they could at least cost, but they did not have the same policy imperatives for assured access to space for all their payloads that DoD does."